When I met her in January, she’d been abusing drugs for such a long time that they controlled the way she walked. The way she talked. How she remembered a sequence of events–if she remembered them. She may not have remembered my name, although I’d given it to her several times; I will certainly never forget hers, however. 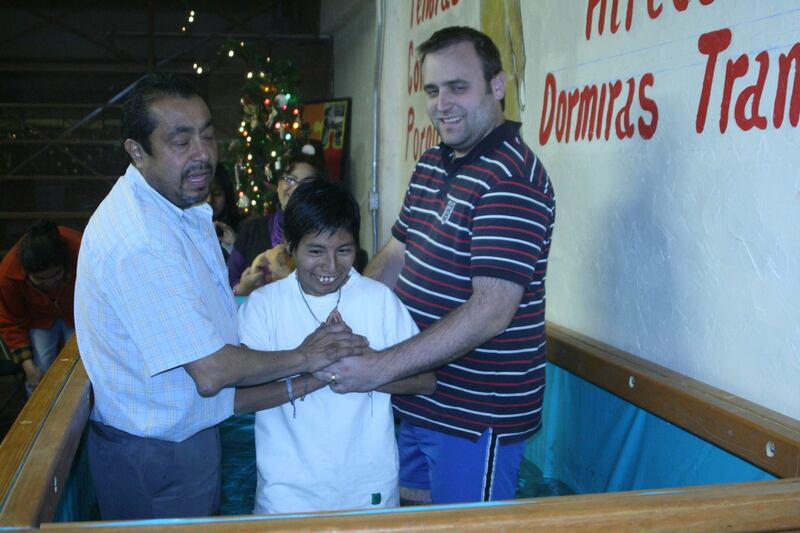 Alex, Jeny, and missionary Steve Cosslett on the day he baptized her several years ago. Her name was Jeny. Like me. That day, Alex, one of the main workers at MEFI (the OMS ministry to street youth in Mexico City) and pictured on the left, affectionately referred to her as “Jennifer Lopez”, which never ceased to bring a smile. She told me that Alex and his wife, Paty, were like parents to her, hers having long since vanished in a city of 30,000,000 souls. They and others, Mexican volunteers and missionaries alike, had built a relationship with her, loving her and teaching her about freedom through forgiveness in Jesus. Just last week the MEFI team received the unfortunate news that Jeny had passed away, her body unwilling to fight the harsh conditions she’d lived with most of her young life. And while we rejoice that she had accepted Jesus as Savior several years ago, even asking to be baptized, we are reminded once again of the bitter realities of working with youth who live on the streets. Death is no stranger to those who live on and walk the streets. Indeed, these are the very ones who worship death–Santa Muerte–hoping their commitment and worship will keep them safe. Get them the things they want or need. Fill the voids in their hearts no amount of drugs, alcohol, thievery, or prostitution will touch. We know that only the peace and forgiveness found in Christ Jesus can fill the voids in their hearts and lives. And so we keep pressing on, striving to reach just one more person for Him. To have the chance to claim them in victory for Christ—before death comes to visit the streets again, taking away their chance for forgiveness and eternal life. April 23, 2014 in Uncategorized.